Has any one heard of the Elder Scrolls? Well it’s this totally awesome series of games from Bethesda Soft Works. My personal favorite is Morrowind, but Oblivion is the latest elder scrolls game. Due to this fact I could not help but instantly be reminded of the Oblivion Gate when I saw Michelle Obama’s dress. 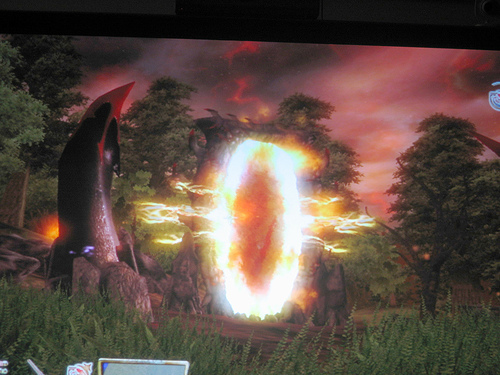 The Oblivion gate is a gate to a hell like other world in the game Oblivion. I tried not to mention the hell dress but Wonkette made the hell dress reference first and I’m just putting my two cents in. Here is the Video of the Oblivion Gate and the whole other world of Oblivion. Here is a photo of Oblivion. The Elder Scrolls has often used the names of various famous people to name objects, since Michelle Obama is wearing an oblivion dress maybe they’ll create some sort of Daedra named after her a female daedra dressed in black and blood red. Halloween was several days ago maybe Mrs. Obama has been so busy she may have accidentally put on her Halloween costume to stand by the side of what will be the first Black President of the United States, maybe they were out of suits and ball gowns that night, hell since they were outside even some slacks and a nice blouse would have been appropriate. Was she out of those too? Finally we may never see Michelle Obama in a suit again because she may be protesting Western Culture and the White Man or if she’s like me when you buy a suit you have to face the fact of what your actual dress size is. For me I am going to put Beyonces figure with my face on my dream board and use the secret to get my body in shape. On the positive side Michelle Obama’s hair and makeup looked great and the children looked totally awesome, they had on great little dresses, and if a mother has to choose between herself and her children, surely the children come first and they did. Finally Michelle Obama has to be admired. She worked hard with Barack Obama to win the presidency. I think that that’s so wonderful. Love her or hate her Michelle Obama is a total winner. Raising The Bar: Whatever You Do, Do Not Vote For R. Joy Walker Chief Judge of Recorders Court For Dekalb County For Superior Court Judge In Dekalb County! If anyone has read this blog in the past they may know that after taking my daughter’s glasses to vision works to be fixed last year after a few months of wear, I left the mall and was very falsely accused of stealing a pair of glasses. I did not have and never have stolen any glasses. I protested this at the time I was accused because I was afraid and I think if someone will falsely accuse you of stealing something they will do anything to you. I was charged with disorderly conduct when I became hysterical because I was falsely accused. There is a new show coming out called raising the bar. I heard about it yesterday and it’s supposed to expose how justice in the United States has a bloody eye and why young attorneys do not want to continue to practice law. I know what they mean because I have been through it personally, the injustice, and also being represented by a brilliant young attorney who I often think does not deserve the treatment meted out to her by recorders court in Dekalb County. In the Court of Dekalb County Recorders Court essentially traffic court, there are many horror stories walking through there. My mother was fined 600.00 for a cat. I appeared in court years ago and told the judge I did not have the money to pay my ticket and she told me I would be put in jail until I paid what amounted to a seventy dollar ticket. I did not have the money. I explained to the judge. She immediately sent me to jail. My family came and paid the ticket within several hours and when I got out I wrote the Department of Justice on the Court. I learned that later that year, they were no longer sending people to jail for not being able to pay their traffic fines. These are just two of my and my family’s experiences that I thought were rather extreme in Dekalb County Recorders Court. Here is a link to several blog entries about experiences in Dekalb County Recorders Court as presided over by R. Joy Walker. Average Life tells of hearing one fine on their automated system and being asked to pay another, Comments to this blog go into detail about their terrible treatment too. One commenter talks about receiving a summons to appear at 8:00 pm. The commenter also states he was carted off to jail for a ticket that he had already paid. This blog talks about a ticket that could not be found in the system! You have to scroll to find it. Now that you have a true idea of what’s going on. I’m going to tell you something so shocking that it will make you pull your hair out. It will make you say, what is happening in the United States and make you seriously question whether some counties and states are bound by the constitution. I have written the FBI and the GBI because what you will read here is just all out corruption and judicial misconduct. I appeared before this court on a disorderly conduct charge. The Chief Judge of this Court is running for Superior Court Judge we can not allow her to have power over people who may go to jail for years. We must preserve some semblance of justice in our court systems and further more we can not afford the embarrassment if she is investigated and found to be corrupt. Do Not Vote For this Woman! In any event this is what I want to tell you. The last message I left for the attorney that represented me on the charge of disorderly conduct who went before the court and had the charges reduced to creating a disturbance, an ordinance rather than a misdemeanor went something like this. I’ve called the court and the court is claiming the charges were not reduced, am I crazy, did I just imagine the charges being reduced. I know I spoke to the attorney that took your place, (the attorney that represents me now practices in a higher court.) He told me that the judge had agreed that it was a mistake and would change it. I went to get a disposition of the case and the woman at the information desk told me that there were now two dispositions in the system, she did not know which disposition to certify. I had to wait for the judge to get out of court. I waited and the judge stated the charges were never reduced. Am I crazy I repeated. I am quite confused now as I ‘m talking to the answering machine. For them to treat an attorney this way, my brain is swirling, she might be in on it too, maybe she does not remember either. I ask one more time because at this point I’m going to call the FBI and the GBI if she calls back and tells me that she remembers what I remember. She calls back a day later and says yes the charges were reduced and the other attorney did speak with the judge about the reduced charges and she has the documentation. I am floored OK, I am relieved I am not crazy. The charges were reduced but the court had me plead guilty to reduced charges and then changed the charges back. I suddenly realize that I am living in a banana republic. I realize that in the United States blacks are allowed to oppress other people and not held to any sort of accountability because we were once slaves and segregated, and instead of holding certain blacks accountable they are allowed to do anything they want to do to assuage white guilt. I should not be living in a banana republic. I live in the United States. Yet corruption and unfairness rule in my part and color of the world. HELP I may as well be In Hussein’s Iraq! For Mrs. Obama Fox Shows Her Best Side! All day I’ve been looking at FOX news as opposed to CNN. The most striking thing about FOX news as it relates to the Obama’s is the really great video and pictures they have of Michelle Obama. They have her looking like Jackie Kennedy Onassis. They have great couple shots. I am really very impressed. As a woman I am very conscious of a photographers eye and how a person comes out based on the way a photographer feels about a subject. Fox news really loves Michelle Obama.